The world-renowned Thai food is known for its unique sour, spicy and sweet flavors coming from traditional Thai ingredients like curry, fish sauce and coconut milk. Each region may have its own cuisine. 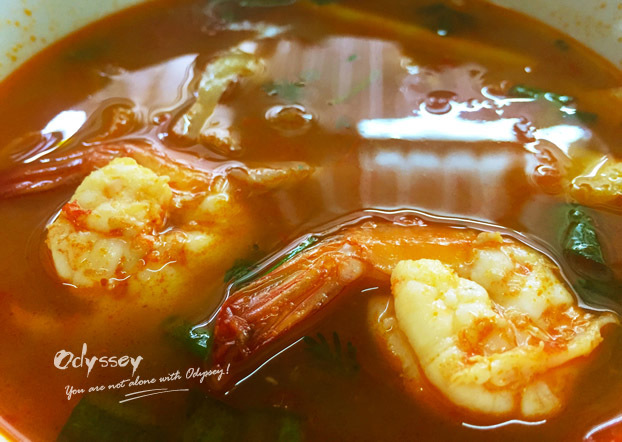 Central Thailand, abundant with fish and rice, is famous for the iconic Tom Yum Gung (soup) made with fresh seafood; food is sour, spicy and sweet. Southern Thailand, home to many Muslims, the cuisine is rich in taste and mainly sour, usually cooked with garlic and yellow ginger. 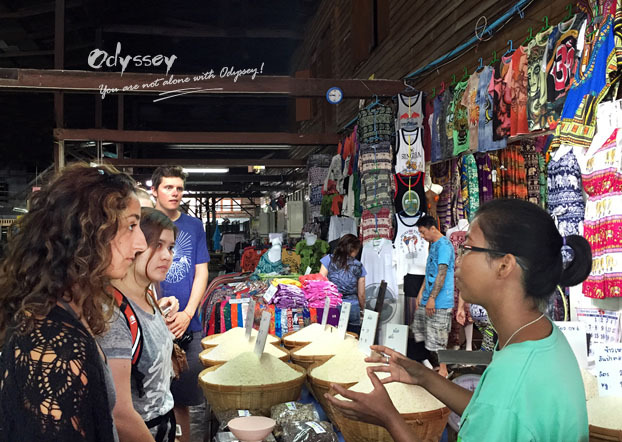 The mountainous northeast of Thailand, where glutinous sticky rice is the staple food and usually paired with fresh sweet mango to make dessert, the traditional food is mainly sour and sweet. 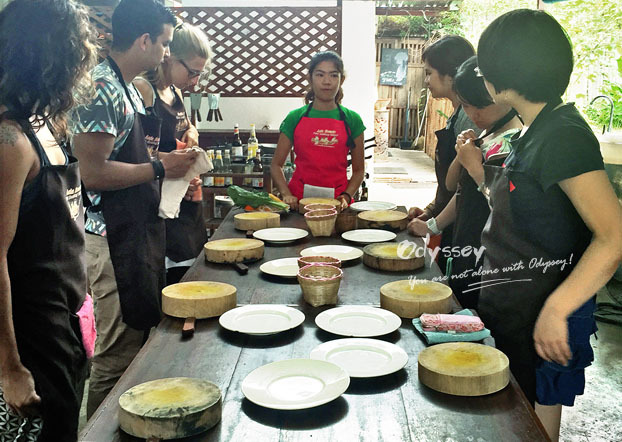 As a devoted Thai food lover, one of my favorite activities whilst traveling in Thailand is doing the ever-popular cooking class. 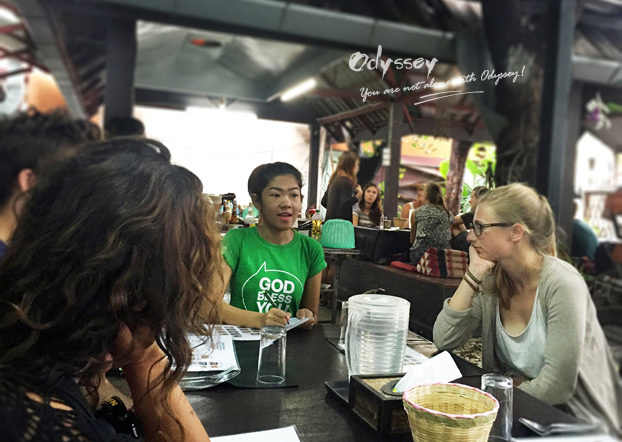 A class that stands out for me was the one I did in Chiang Mai. The school is Odynovo's favorite pick, with expert chefs to guide you along the way from shopping for ingredients in the market to displaying food artfully in your plate. Our patient, talented teacher Gayray was great at explaining everything and brought the whole experience to a new level! The day started at 8:30 a.m with a pick-up from the hotel and the van took us to the school located in the bustling old city of Chiang Mai. Around 9 a.m., food buffs from all over the world have been ready for a Thai culinary adventure. Each class is kept small between two to five guests.  At the very beginning, Gayray discussed with all learners in the small group on what to cook. In the half-day cooking class, we can cook curry paste, curry, spring roll and 2 more dishes from 4 categories that we can discuss the people in the class: stir-fried dish, salad, soup and dessert. In the chose category, everyone can pick his/her favorite dish to cook. 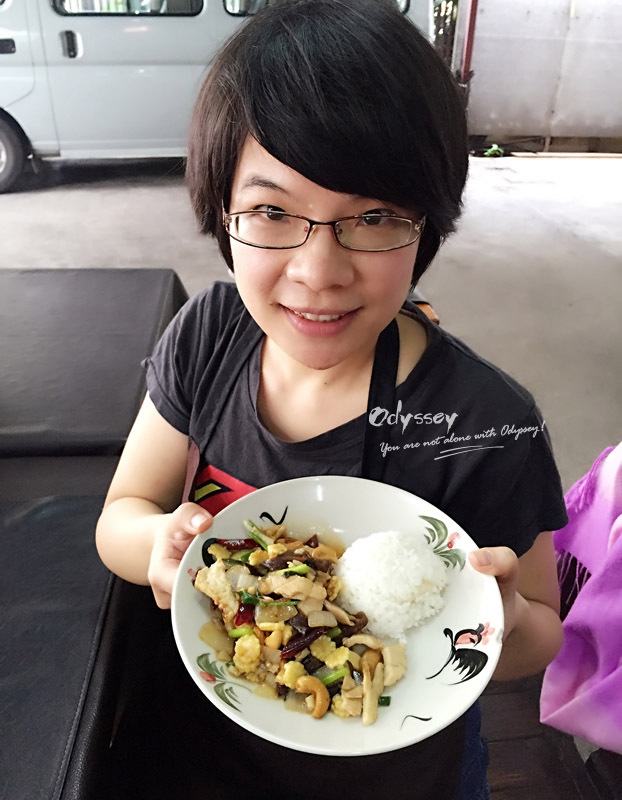 I was fortunate to choose to learn two dishes: Stir-fried Cashewnut with Chicken and Tom Yum Gung (soup). Meanwhile, since I don't like spicy food very much, I specially selected Panang Curry, the least spicy curry. 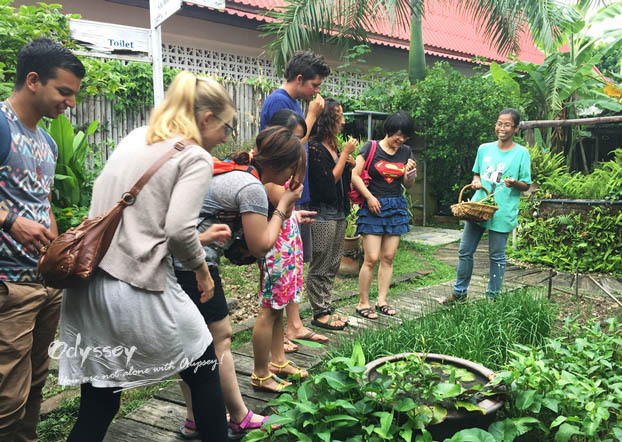 Next the guide took us to an organic kitchen garden and taught us all about local ingredients, such as how to identify various types of spices that commonly used in Thai cuisine, the differences between ginger, galangal and turmeric, and the differences between hot basil, Thai sweet basil and lemon basil. 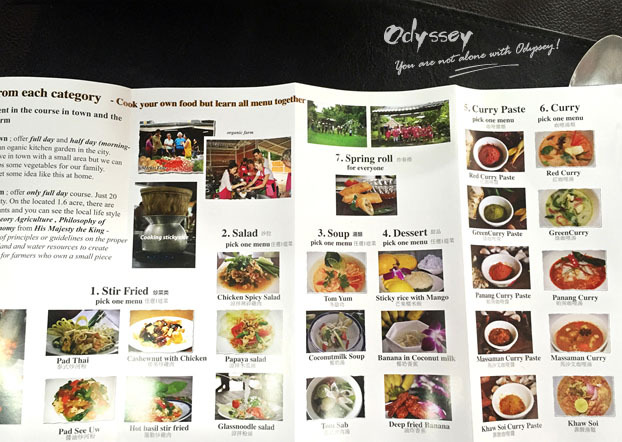 The guide showed us the various herbs that make Thai dishes so tantalizing. Then it was a 5 minutes' walk to a bustling local market where we got to see how locals picking up items for their home kitchen and buy produce needed for the upcoming meal. 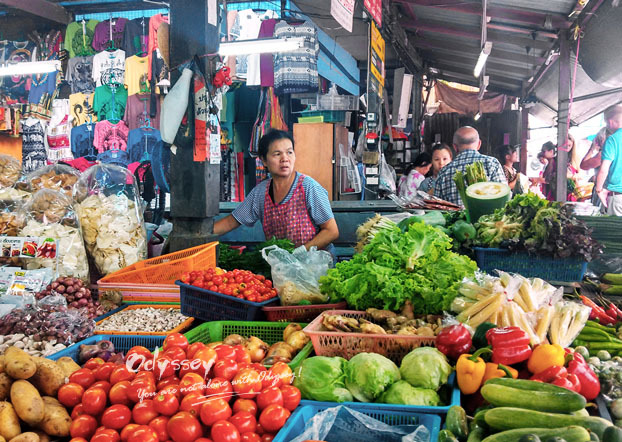 The market sells all kinds of fresh meat, fruits, vegetables, herbs, and spices. My senses were loaded with the sight of so many food items, the smell of pungent spices and the soft voices of locals in haggling. I felt as though I was blended into the environment and became a local. She was excellent in showing us different produce and explaining how it is used in Thai cooking. 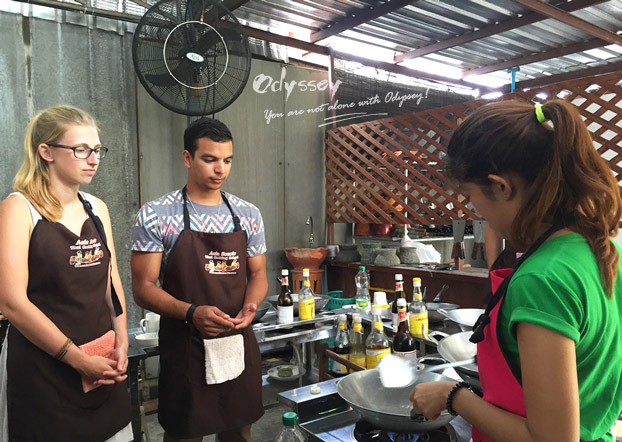 After the market tour, we started the learning of the first course: a stir-fried dish. After a round of introduction to ingredients needed for the desired dish, condiments and cooking techniques, Gayray demonstrated how to prepare and cook each dish before it was our turn to give it a go. We were listening to the instruction of Gayray. It is simpler than I expected to cook the Stir-fried Cashew Chicken. The key is to put them into sizzling oils, stir-fry, and use three spoons of oyster sauce of one spoon of soybean sauce to add extra flavors. After the dish was finished, it was laid out on the plate with upturned rice, upgraded into a refined Thai specialty. I pigged out and felt like a top-notch Thai chef! Me and Stir-fried Cashew Chicken! Next was the cooking of Thai-style spring rolls. 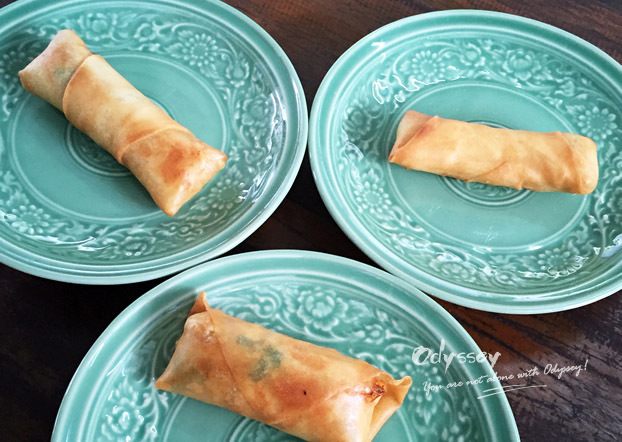 Different from Vietnamese spring rolls, the Thai style spring rolls use flour paste instead of rice paper as a wrapper. Firstly fry the fillings composed of carrots, bean sprouts, garlic, vermicelli, etc, then put them in the wrapper and roll up, use a little-beaten egg to stick the edge of the spring roll and finally fry them in the sizzling oil until golden. Heat control is the key to make the crispy spring rolls. Time for the iconic Thai soup - Tom Yum Gung. The use of many spices and herbs like lemongrass, galangal, kafr lime leave and chilies is the secret to produce complex flavors of the soup. To add to the sourness and spiciness, tomatoes, lemons, and chilli sauce are essential. 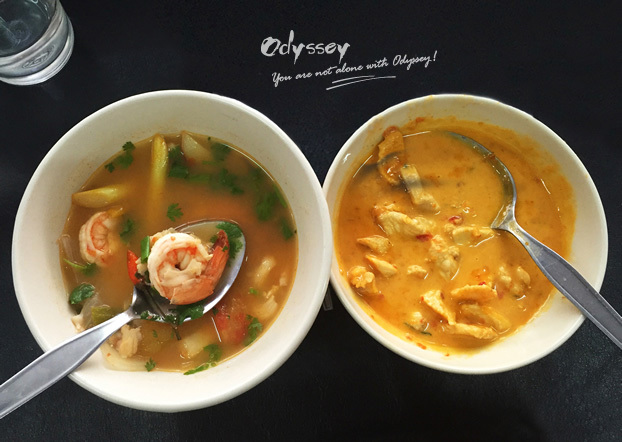 The difference between Tom Yum Gung and other Thai soups is that, it is usually made without coconut milk. Thus the flavor is more sour and spicy rather than sweet. 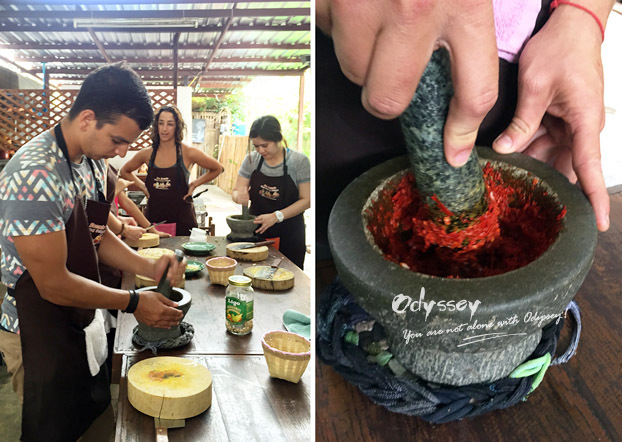 Then we started to cook curry paste and had the freedom to choose how spicy the dishes to be. From the least spicy Panang Curry to the pungent-to-tears Khaw Soi Curry Pates, each paste uses different ingredients and way of cooking. We were making curry paste! After the curry paste was pestled, we started to cook the final course: curry soup. The curry soup is a mixture of spicy curry, sweet coconut milk and palm sugar, a different version of Indian curry soup. Fish sauce instead of oyster sauce is added into the soup, otherwise, the soup is less tasty and looks black. 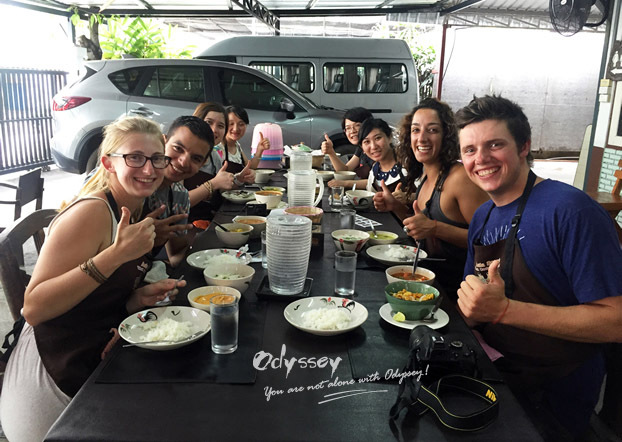 The morning passed by so soon, till noon we had learned a lot about how to cook authentic Thai dishes, it was time for the feast to begin! We indulged in the fruits of our labor while laughing and chit-chatting. The reward! A wonderful meal with new friends. Around 1:30 pm, the wonderful cooking class came to an end; it was time for the guide and driver to transfer our merry band to our respective hotels, and I couldn't wait to make the dishes back home!